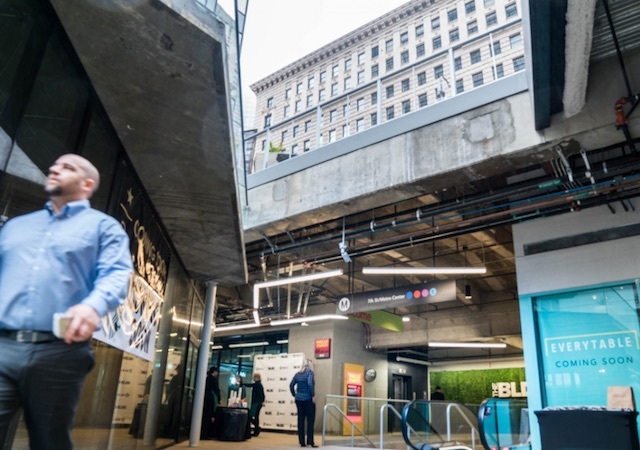 On Tuesday, Metro opened a new underground pedestrian walkway connecting a major downtown subway station with a shopping center. Dave Sotero, a communications manager at Metro, told KPCC that the passageway is a first of its kind in the Metro system. The passage will allow commuters from the 7th Street/Metro Center Station to walk directly to The Bloc, the looming shopping center by 7th and Flower streets. Prior to the opening of this passage, pedestrians at the Metro stop had to exit the station and cross busy 7th Street to get to the mall. According to Sotero, the 7th Street/Metro Center station is Metro&apos;s second busiest station, with approximately 50,000 boardings per day. As noted at The Source, Metro&apos;s blog, the passageway was built to "create the type of interconnected space that makes for an appealing destination for residents, workers and visitors alike." The Bloc is still very much a work in progress. While the anchor store (a giant Macy&apos;s) is already open, the space is still waiting on a Alamo Drafthouse Cinema theater, as well as a couple coffeeshops and a Popbar, that purveyor of frozen gelato. The Bloc is at 700 South Flower, downtown.